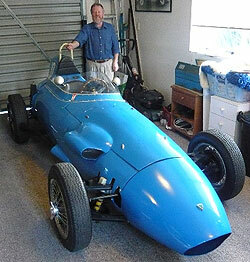 Nigel Russell and I have just viewed Allan Cattle’s new acquisition – a beautiful blue Volpini, chassis #007 (see photo). It is a great looking car and has a good history having originally been imported into the USA by Volpini distributor, Biener Pontiac and run in period in the US, but in more recent times residing in the UK. It brings our front engined fleet to 13 cars and with rumours of a few more rear engined Juniors about to hit our shores our grid seems to be ever growing. We have eight cars confirmed for Eastern Creek in November with this likely to rise to nine cars. There is some discussion around the AFJA putting on a race at Sandown in early November but nothing is confirmed as yet. The last race of the season was the TACCOC event at Pukekohe on 11th April and it turned out to be fantastic weather with lots of racing (the same amount of track time in one day that you would normally get in a two day meeting). Contestants were Nigel Russell (Emeryson Elfin Mk1), Wayne Rodgers (Lynx), Rob Douglas (Donford), Neil Tolich (in Roger Herrick’s Taraschi), Jim Barclay (Gemini Mk3a), Roger Herrick (Lola Mk2) and John Holmes (Lotus 18). The Juniors virtually had their own grid (a TACCOC policy), with only two U2 sports cars and an F3 Cooper joining in. Unfortunately John Holmes retired early for the day with no front brakes and Rob Douglas was plagued with electrical gremlins. Wayne Rodgers broke a top rear link resulting in the half shaft breaking, after having set a very quick time in the 1.15s and Neil Tolich ran out of fuel in the Taraschi but had a couple of good runs putting in very competitive times. Nigel had a minor issue with loose wires (in the car!) but had the Emeryson running well by the end of the day. Roger and Jim had some good dices with the Lola having a little more top end grunt (which is handy at a track like Pukekohe).